Winnie-the-Pooh: Exploring a Classic will be a multi-sensory, playful exhibition that will explore the magical world of Winnie-the-Pooh – one of the most adored fictional characters of all time. The exhibition will reveal the real people, relationships and inspirations behind the charismatic bear, star of the most popular children’s books of all time, and a world representing friendship, simple joys and the curious yet gentle nature of a child’s imagination. Visitors will be taken on a journey exploring the thrilling interplay between text and illustration, shedding new light on the creative collaboration between Milne and Shepard. The exhibition will explore Milne’s storytelling including his wonderful and humorous use of language. It will also look at how Shepard produced enduring illustrations, combining expressive line with white space and an understated humour matching that of Milne. Visiting children will be encouraged to explore their own creativity through art and word play. Spanning more than 90 years of history of the popular British bear, the exhibition delves into the archives of the V&A, The Walt Disney Company, Egmont Publishing, The Shepard Trust and The University of Surrey, to feature around 230 works from 1920 to the present day. Items of international significance will be on show, including original illustrations, manuscripts, proofs and early editions, letters, photographs, cartoons, ceramics and fashion, all featuring the much-loved character and his friends: Christopher Robin, Eeyore, Kanga and Roo, Owl, Piglet, Rabbit and Tigger. And, for the first time, the pencil sketch and the pen and ink drawing of the celebrated ‘Poohsticks’ illustration featuring Winnie-the-Pooh, Piglet and Christopher Robin will go on display side by side; international collectors are lending the two works especially for the exhibition. There will also be video and audio clips, including a 1929 recording of Milne reading Winnie-the-Pooh. Tom Piper, the designer of the field of poppies artwork Wave and Weeping Window, has worked with RFK architects on the exhibition design. As well as featuring the largest ever selection of prints and drawings, the exhibition will include a large-scale, immersive family section reimagining scenes from the most famous stories such as Poohsticks Bridge, the Bee Tree and Eeyore’s house, with many interactive elements to engage younger visitors, including dressing up areas, storytelling trees and a ‘picnic’ drawing table. Universally recognised motifs of Winnie-the-Pooh will feature around the exhibition such as balloons and umbrellas, and Milne’s words will be made physical as playful mobiles and 3-D poetry.  A.A. Milne’s Winnie-the-Pooh manuscript and pages from the manuscript of House at Pooh Corner from the Wren Library at Trinity College, Cambridge.  E.H. Shepard’s first Winnie-the-Pooh character portraits, made by copying A.A. Milne’s son Christopher’s real toys, and original sketches of the forest landscape.  A Christopher Robin nursery tea set presented to Princess Elizabeth in 1928, generously lent by Her Majesty the Queen from the Royal Collection. 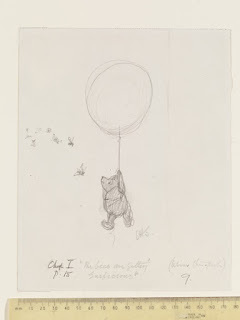  An extraordinary number of original pencil and pen and ink drawings for Winnie-thePooh and House at Pooh Corner including the best-known illustrations. Winnie-the-Pooh: Exploring a Classic will explore how Pooh and Friends have entered our collective imagination, extending beyond the original stories into global popular culture through Walt Disney animation, art, fashion, politics and philosophy. And show how Pooh’s story, including his valuable life lessons on friendship, have stood the test of time with families around the world. It will look at the real life British inspirations behind the stories - A.A. Milne’s son Christopher, his real childhood toys and sketches of Ashdown Forest that inspired the setting, including particular trees that became Owl’s and Piglet’s houses in Shepard’s illustrations. The V&A Museum of Childhood in Bethnal Green will host a complementary display of teddy bears to coincide with the exhibition.